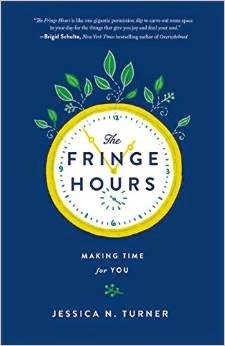 I was fortunate to receive an advance copy of The Fringe Hours by Jessica Turner to read, and it came at just the right time. The book is about the need to create space for things that you love. It's interesting because this has always been really important to me, but sometimes I feel like I'm the only one. Take Fridays--I have the day off and my kids have daycare, so I generally take time for myself then. Each week, I stop at a local coffee shop and settle in with a latte and a book, if only for a few stolen minutes. I also love meeting up with friends for coffee and hanging out, but those quiet moments to read on a busy Friday are vital to me. Sometimes, I'll run into an acquaintance who is in awe of the fact that I'm sitting and relaxing--and it makes me wonder if I'm unusual for needing that mental space, or if we ALL need that sometimes but don't allow ourselves permission. Reading this book totally reaffirmed my efforts in carving out space for the things that make me feel engaged, passionate, and deeply me. Speaking of other important things, my little sis helped create a short movie about the dangers of texting and driving: watch it below! I'm so proud of her! As part of a project, my sister and her friends have set up a pledge to avoid texting and driving--go and sign HERE! Even though texting and driving is often presented as a "teen issue" I think it's SO important for all of us to keep in mind. In the age of the iPhone, when it takes enormous self control to avoid checking constant messages, we all have to remember the times to stop, put the phone away, and focus on something else more important. Interestingly, both of these pieces come back to one thing: TIME, and how to use it. May we all use it safely and intentionally. What is taking up YOUR time today? I loved the Fringe Hours, too! It was exactly what I needed to hear. Today, I'm spending some quiet time while my son naps blogging. And reading is also on my list when I can find some more fringe moments. Blessings on your Friday! I'm one of those people who really needs to take a break and but just never does (at least there's Shabbos to make me slow down). Your Friday ritual sounds so nice! cheap ray ban sunglasses australia To cheap ray ban sunglasses online me that is really expensive movie tickets, sixty dollars a, bank robbery ah, I have to buy a lot of packages Sanjiang. Determined cheap ray bans australia store to want to express yourself cheap ray ban sunglasses australia cursed for her dissatisfaction, but it wants to act in public ratio, cheap ray ban sunglasses australia so shameful sale began hypocritical. cheap said Miss freezing rain not only sing well, the cheap ray ban sunglasses play was also stick. nike air max 2015 pas cher cheap squinting his Achat de casquettes New Era eyes, was surprised, immediately exposing greedy nike air max 2015 pas cher face, ingratiating smile on his face walked in front of the old nike air max 2015 pas cher man. And nike air max 2015 pas cher he let the old man in exchange for almost adidas zx 750 sale fainted. The old man was furious and I do not need plastic bottles.